A certified welder shall perform all welding. 70,000 psi welding rod or wire shall be used to complete the welds. 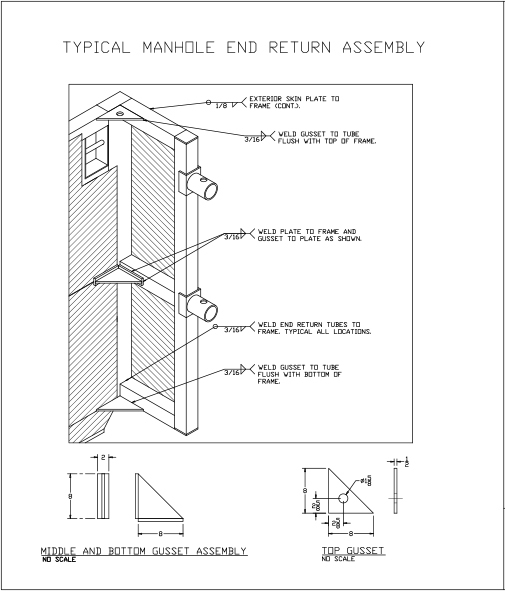 The Replacement end return and all components needed in the assembly shall be manufactured by GME. Cut off damaged end return, being careful not to cut into the vertical tube. Clean the area to be welded thoroughly with a wire brush or grinding wheel. Place pre-fabricated man-hole end return on to the end of the man-hole. Top of end return assembly to be flush with top horizontal tube on man hole shield. Place gussets as shown in diagram. Center the middle gusset assembly horizontally along the middle horizontal of end return as shown. The top gusset to be welded flush with the top of the shield and the bottom gusset to be welded flush to the bottom of the end return as shown.